Discover a hidden gem along the coastline, where the trees protect a building serving food to enchant your five senses. Feast your eyes on the magnificent stretch of beach, admire the open space and feel the cool air under the canopy of trees. Hear the distant sound of gulls flying and leave your other senses to feel the impact of the food being served. The Pizzeria Cahuita focuses on simplicity, and inspires the purpose it’s built for- Pizza! Pizzeria Cahuita is one with the land. It is free of clutter and unnecessary elements. The focus is on the space inside and outside. The elements of colour, design, texture and the furnishings all create a unique ambience. The use of glass windows makes this restaurant bright and cheerful. There is a patio with seating arrangements as well and you can hear the ocean while you eat. The owners, an Italian couple are very friendly and ensure that service is quick. Even the staff serving the guests are warm and welcoming. They cook up a dish and serve you is less than an hour, and in order to accommodate you while you wait, wine and bread is served. They have free delivery services to most parts of Cahuita and are very prompt on delivery. Fresh ingredients are used in the variety of mouth-watering dishes that is available on the menu. A large brick oven is used to cook the pizza and other very appetising Italian cuisine. The chefs whip up a range of dishes from the depth of the ocean like snapper and prawns, crayfish, all with a strong taste of the sea, with their succulent texture and taste. Fresh from the oven are perfect melt in your mouth food like ravioli, lasagne, scampi, pesto gnocchi, pancetta and bruschetta, all cooked to perfection. The desserts such as tiramisu, and the chocolate cake, look like masterpieces. Juicy steak cooked tenderly with fresh herbs fall into pieces on your plate. But the incredible pizzas is what draws tourists to this place like moth to a light. You have travelled this far to taste the pizzas here, and the blend of five cheeses, with the tomato sauce and meat on thin crust is a sheer gastronomical delight. There is an apartment available on rent but it has to be booked in advance. How popular is Pizzeria Cahuita? People normally club together Cahuita National Park and Caribbean Coconut while planning their visit to Pizzeria Cahuita. Awesome food, but even better service. This place is so close to the beach, you enjoy THE BEST pizza ever (even better than in Italy) with the sound of waves crashing. The seafood is also incredible, we had pasta and fresh fish. Desserts are also to die for. best pizza on our central america trip by far! 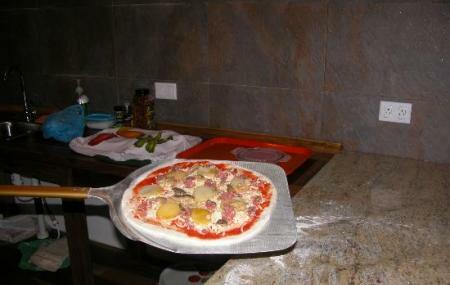 it is indeed a typical Italian pizza, must visit if you spend a night in Cahuita. try the chorizo which is a homemade italian sausage!! Best Italian food in the area. Always has fresh pastas. Highly recommended. Best pizza I've had in a long time. We went 2 nights in a row because it is irresistible! La pizza mejor! Fuimos 2 noches porque es irresistible!